These days there is an advertisement on TV that just takes my heart away! It is an ad of Cadbury Silk chocolate where a woman and man are licking on the chocolate in their respective cars while they wait for the green signal at a traffic light. 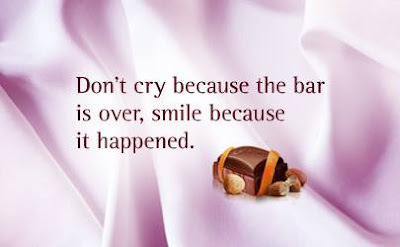 It is basically the smile of the two Cadbury chocolate fans that make up the little sweet story of the ad. Each time I watch this ad, I go back to that beautiful time in my life when some small, little stories such as the above were the main source of my joy. I have had countless of such experiences and I am sure everyone has. It is just about having a sensitive heart. When you are sensitive to others’ feelings and try to take things in a positive light, even an irrelevant and unnoticeable incident becomes an important story of your life. These sweet and small romances are the people, things and incidents that make life just a little more beautiful. They may not add anything to your life per se, but they add a lot to you as a human being and to your store of memories. These are the moments that when recalled, make a dull moment a happy moment. If I go back to my life, I can think of many of such incidents but few instantly crop up in my head. One such story goes back to mid 2000s when I was flying from one metro to another. I don’t remember the sector I was flying on and nor I remember the time of my journey but yeah, I do remember that I was flying on Jet Airways. We all know Jet has always been a pioneer in customers service. My story just proves that. As I boarded the flight, I started to feel a little cold. I guess it was an evening flight. I generally feel very cold in flights so usually I ask for a blanket. That day, I noticed that the crew was busy in attending to other passengers who were frequently calling up on them. I waited for a while and finally pressed the call button. A handsome, sweet flight steward came to my seat. I was not only deeply impressed by his gesture of taking off his coat and offering it to me, I was also highly obliged that he took notice of my problem and tried to help me out by going out of his way. I agreed and wore his blazer for the entire flight and he was so right about it. It indeed kept me warm and I got down from the flight without a single sneeze. Though I am not sure but I think I kept a small note in his pocket that said ‘Thank You!’ and as I handed over his coat to him, I thanked him profusely. I don’t remember his name now and I don’t even remember his face but I clearly remember his gesture and would keep it my mind throughout. It was not only his thorough professionalism and his utter sense of duty but also his gentleman-ness that greatly impressed me and made him a person I would be thankful to, always! Many a times we meet people who amaze us with their kindness, love and compassion. These are the people who make world a better place and who kind of counter balance the people who continue to disappoint us with their shrewdness! Since, I want Womanatics as a very positive and inspiring place, I want to celebrate the spirit of the former kinds. Do you think it would be a great idea to start a series like this where we share our experiences of kindness by strangers, or encounters with the small romances of life?! If yes, shoot in the comments and send me your sweet, little stories on womanatics at gmail dot com. I Saw, I Learnt: A Short Romance With Learning In Life! Lovely post! reminded me of my own many istances of sharing unconditional happiness with strangers. I think you should definitely start such a series where readers post their happy, inspiring stories. Will mail you mine soon! Hey Shireen, wow..! so I have one YES! yay!!! I would love to post such happy stories here too. Would spread happiness around.. hai na..?! thankyou and I am waiting to read your story. Send it super soon. You should definitely start the series Surabhi 🙂 I have been a silent reader but today I couldn't stop myself from commenting 🙂 Stay happy. God Bless You!!! Hi Preeti.. Thanks for writing to me and why a silent reader.. you should write often. I love hearing from my readers and thats my only motivation! 🙂 Would start the series and would wait for your contribution too. So.. send me a sweet romance story like this.. 😀 am waiting. Hey PK, but you all have to send me your stories! The series is not possible without readers' contribution! So send me your right away. Dont worry about the language, though you write very well :).. just send it across. I have another story to tell. But it is little different. We were all invited for a house warming ceremony, at the breakfast venue a guy was making hot masala dosas and serving to all of us. Everyone enjoyed and talked to themselves that the masala dosas are very tasty and left the venue. After my break fast I went to him and said "You made excellent dosas" they are very tasty!! Believe it or not that appreciation gave him biggest satisfaction and he was so happy by looking at his happiness i too felt very happy. Oh! So you are reading my blog during office time. This is one bad thing I won't ask you to quit.. 😉 hihihi. I so agree with what you have said. A little appreciation goes a very long way. For some it is even more important and valuable than monetary possessions. Glad you made the chef's day! Keep writing. It is good to have you here.